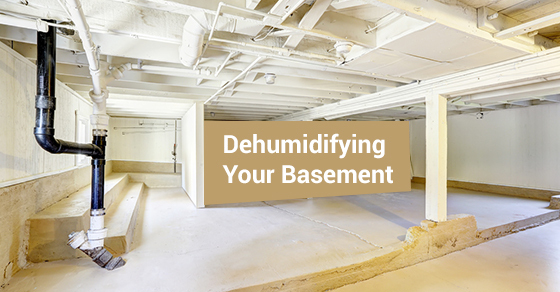 If you notice a lot of humidity in your basement, it is important to take action right away – even if you don’t spend any time in your basement. Taking action means not only reducing the amount of humidity in your home, but also determining the cause of the humidity. Basement humidity can be caused by water leaks in other parts of your home, as well as household activities, from laundry to showering. Regardless of the cause, however, humidity can cause mould to grow and can eventually even cause structural problems as the dampness causes wood to rot, which is why it is so important to take immediate action. Keep in mind that the cause of humidity in your home will ultimately determine what method you choose to get rid of that same humidity. Do you notice any leaks on your walls or ceiling due to potential leaks? Do you have puddles of water in your basement due to cracks in your foundation? If either situation applies to you, your best course of action is to contact a professional plumber immediately. The plumber will be able to address the direct cause of the humidity in your home. He or she will repair any necessary leaks and/or recommend basement waterproofing services to address the issues with your foundation. Any puddles of water in your basement can also be caused by the roof of your home; in the event that your eavestrough leaks or if your downspouts are not extended far enough from your house, moisture can seep into your home via tiny cracks in your foundation. Ensure that downspouts extend at least 6 feet away from your house. Another cause of basement humidity is due to household activities such as laundry. Ensure that it is properly ventilated to the outside; otherwise, moisture problems will begin immediately. You can offset humidity caused by household activities (as well as prevent humidity, in some cases) by turning on a dehumidifier. If you don’t have one, consider investing in an energy-efficient one. Pro Tip: Ensure that you choose the correct size for your basement; also keep it clean. One common cause of humid basements is a lack of proper airflow. Get air circulating any way you can: open windows or turn on the air conditioner or fans for a couple of hours a day. If you have a lot of humidity in your basement or you are in need of professional basement waterproofing services, contact Brothers Plumbing today. We are one of Toronto’s leading plumbing providers with over 50 years in the industry. Our services are available at very affordable rates and at a time that is right for you. Our basement waterproofing service uses some of the most advanced technology to protect your basement.